Note – pilots note that out of published operating hours there will be no aerodrome emergency services available. RW 18 Arrivals – to avoid overflying the farmhouse / riding centre west of the extended centre line, on base leg fly on northern side of electrical cables 1800m north of aerodrome until established on extended line. RW 36 Departures – to avoid overflying the farm house / riding centre West of the extended line, after take off, track 5° right of the extended line and maintain until passing the electrical cables 1800m North of the aerodrome. RW 08/26 Arrivals – landing traffic vacate onto the northern taxiway and proceed to parking or fuel via the RW18/36 western taxiway. RW 18 Departures – taxi to Hold Echo or cross with care to the western taxiway and proceed to Hold Whiskey. RW 36/08/26 Departures – departing traffic to cross to the western taxiway and proceed to Hold Bravo (by the windsock). RW 26 Departures – departing traffic backtrack RW 26 to line up, only when the approach is clear of landing traffic. 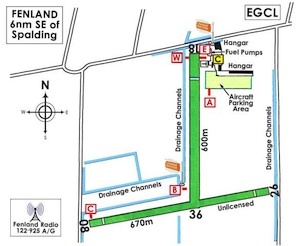 Fenland aerodrome operates a Ground Radio Service 122.930 MHz, using the call sign ‘Fenland Radio’. If no answer Pilots should provide relevant safety information on frequency 122.930 MHz, using the call sign ‘Fenland Traffic’. Aerodrome wind direction from the wind sleeve at Hold Bravo located at runway intersection 18/36 & 08/26. Pilots should ‘sign in’ at the Clubhouse in accordance with Rules of the Air (Rule 38). Please do not park in front of the Clubhouse, Flying School or the first two lines of parking (which are reserved for the Flying School aircraft). Fenland Aerodrome is unlicensed on Mondays. Clubhouse facilities will be limited and catering may not be available. Self service fuel (Avgas & UL91) is available. WARNING – pilots are warned that during the summer months grass cutting and other maintenance is undertaken on Mondays; therefore, pilots should exercise extreme caution when using the airfield.